A group of five islands around 25km west of Koh Lanta separated by deep water channels. There are six different places to dive here and visibility is usually good. Marine life is plentiful here with all the regular visitors including morays and nudibranchs with the bigger tuna, jacks and trevally hunting in the deeper waters. There is a series of caves at the largest island, Koh Hah Yai, where natural light filters into a large underwater chamber. The entrance is at about 12 meters and you can actually surface inside to view some spectacular overhanging stalagtites. Koh Lanta's Closest Dive Site. The dive sites at Ko Haa offer beautiful scuba diving and snorkelling with spectacular visibility. Diving at Ko Haa is suitable for divers of all levels. Ko Haa's highlights include The Lagoon, The Cathedral, and other caverns, inter-connected chambers and swim-throughs. 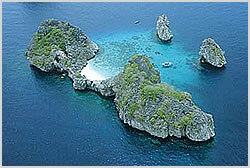 Ko Haa, which means �Five Islands� in Thai, has a central lagoon area that is ideal for beginners. It offers a safe and relaxed starting point for you to take your first underwater breaths and there are some extremely friendly little Porcupine Puffer Fish, ready to make your acquaintance in the large, sandy bay area. The bay slopes gently onto the reef allowing you to progress into your first dive effortlessly. The marine life that can be found at Ko Haa varies from rare Ghost Pipefish measuring only a few centimetres, to an abundance of Octopus hiding amongst the rocks and crevices. A Hawksbill Turtle is often seen swimming amongst the pristine coral. Manta Rays, Marble Rays, Eagle Rays and even Whale Sharks are spotted here occasionally. You can�t predict exactly what you'll see, but it�s always a pleasant and rewarding surprise!